The challenge will run from January 1, 2009 through December 31, 2009. Since this is an author challenge, there is no restriction on choosing your novels. They can definitely be from other challenges. However, the authors must be new to you and, preferably from novels, but anthologies are also a great way to try someone new. I want this to be an easy challenge, so you state how many new authors you want to try this year and then that’s your challenge. 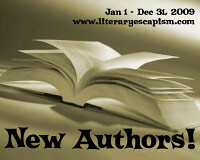 For me, I’m trying another 50 new authors. If you want a number given to you, try for either 25 or 50. Add your name to the Mr. Linky below. If you do not have your own blog, you can join the group blog here. When you read a new author, write your review and then come back here and post a link to your review. If you’re looking for some ideas, check out the Author page. Added 11/11/08 – I’m not sure who drew up the image, but it’s been showing up on a lot of participants pages so I thought I would also include it here. If anyone has any other logos, send them my way and I’ll include them on this page. I just tried to leave a comment for the 2010 challenge but it is not accepting comments. I signed up for it but forgot to include how many books I’m going for, 20. This is my list of authors that I found this year. Most were really good, so what a great success. The suggestions you shared here are incredibly valuable. It absolutely was such an enjoyable surprise to have that waiting for me when I woke up today. They are often to the point as well as simple to learn. Thanks for your time for the clever ideas you have shared here. It is very rare these days to find websites that provide info someone is watching for. I am glad to see that your site share valued info that can help to many scaners. nice one and keep writing! Hey! Good post! Please do keep us posted when all will see a follow up! After I initially commented I clicked the -Notify me when new feedback are added- checkbox and now each time a remark is added I get four emails with the same comment. Is there any method you’ll be able to remove me from that service? Thanks! Somebody essentially lend a hand to make severely articles I would state. This is the first time I frequented your website page and up to now? I amazed with the analysis you made to create this actual publish amazing. Great activity! Contamos con diferentes unidades móviles capacitada con todo lo necesario para la reparación, desde repuestos hasta la ultima herramienta necesaria para la reparación de su electrodoméstico Siemens por eso garantizamos el servicio técnico siemens en toda la Isla de Gran Canarias con una reparación a domicilio rápida y eficaz. Nuestros clientes obtienen una gran cantidad de beneficios en el momento en el que confian la gestión y reparación de sus electrodomésticos Siemens en nuestras manos,como. DESPLAZAMIENTO GRATIS si se realiza la reparación de su electrodoméstico Siemens.